I've posted on this topic several times before but I thought it was worth re-iterating. There is not one but at least two different forms of disruption. Don't confuse them. To explain the two types, it's best to use a map and then look at the characteristics of both types. In figure 1, I've provided a very simple map from a customer (the user) who has a need for a component activity (A) which in turn needs a component (B) which in turns needs component C and so on. Each component is shown as a node in the map with interfaces as links. The black bars represent inertia to change. Figure 1 - a Basic Map. 1. How to map, see an introduction to mapping. 2. Evolution, see mapping and the evolution axis. Now, every component is evolving from the uncharted space to becoming more industrialised through the effects of supply and demand competition. Hence activity A evolves from A1 to A2 to A3 etc. Most of the time such evolution is sustaining i.e. it involves incremental improvements in the act e.g. a better phone. However, there are two forms of non-sustaining and disruptive change that are possible. The first is the product to product substitution, shown as B1 to B2. The second is product to commodity (or utility) substitution, shown as C1 to C2. These two forms of disruption are very different but in both cases we will have inertia to the change (drawn as a black bar). I won't go through the various forms of inertia, there are at least 16 different types and you can read about them in this post on Inertia to change. What I want to focus on is the characteristics of these two forms of disruption. To begin with, I'll just simply list the differences in table 1 and explain afterwards. Table 1 - Characteristics of the two forms of disruption. Now both forms of disruption threaten past industries. Examples of this would be product to product substitution such as Apple iPhone vs RIM Blackberry or product to utility substitution such as Amazon EC2 vs IBM / HP / Dell server businesses. However, both forms of disruption are NOT equally predictable. In the case of product to product substitution it is almost impossible to predict what, when and who. There's a set of complex reasons for this (beyond the scope of this post) which mean that this form of disruption depends upon individual actors actions. Hence Christensen, Gartner, RIM and Nokia didn't get it utterly wrong on the iPhone because they're daft but instead because it's unpredictable and those claiming to predict are suffering from (as Hayek would call it) 'a pretence of knowledge'. Equally, people who got it right were ... just lucky. In the case of product to commodity substitution (e.g. product based computing such as servers evolving to utility computing) then this is moderately predictable in terms of what and when but not whom. This is because it is dependent upon competition (between all actors) rather than individual actors actions. This turns out to be predictable through weak signals, which is why we could feel back in 2004 that the change to cloud was going to happen soon. We also anticipated well in advance what the effects would be (e,g, efficiency, agility in building higher order systems, co-evolution of practices, new forms of data etc) as they are caused by common repeatable patterns. However, that said - we didn't know who was going to play the game i.e. which individual actor was going to make the change. In terms of anticipation, the subject matter of cloud had actually been well explored from Douglas Parkhill's book on the Challenge of the Computer Utility, 1966 and onwards. Everybody in this space (e.g. all the hardware vendors) should have been aware of the oncoming storm. They should have all been able to anticipate and hence have been well prepared. I need to emphasise that product to utility substitution gives you ample warning in advance, often ten years or more. However, this assumes you have reasonable levels of situational awareness and it's situational awareness that is the key to defence. If you exist in a firm which has little to none (the majority) then even that which you should anticipate comes as a complete shock. Even if you have the situational awareness necessary to see the oncoming storm then you'll still need to manage the inertia you have to change but since you've got lots of warning then you can prepare. In the case of product to product substitution, well you can't anticipate. The best you can hope to do is notice the change through horizon scanning and only when that change is well upon you i.e. it's in play. There is no advance warning given with product to product substitution and yes you'll have inertia to the change. The key to defence is to have a highly adaptable culture and even then that's no guarantee. When it comes to impact, then beyond disruption of past industries the impact of the two forms are different. Product to product substitution tends not to create new practices, it's not associated with new forms of organisation or rapid increases in data and new activities. However, product to commodity substitution is associated with rapid increases in data and new activities along with co-evolution of practice and new forms of organisation. When it comes to gameplay then with product to product substitution there is little option for positioning and your gameplay choices are limited e.g. acquire, copy or abandon the market (before it kills you). With product to commodity (+utility) substitution then because you have advance warning you can position yourself to take advantage of the known effects. There is ample scope for strategic play from being a first mover to building ecosystems to manipulation of the market through open means - assuming that you have good situational awareness and know what you're doing. A classic example of good play is Canonical (with Ubuntu) vs Red Hat and others and how Canonical took the cloud market with relative ease. These two different forms of disruption are also associated with different economic states - one known as peace, one known as war - however that's outside the scope of this post. More on that can be found in this post on peace, war and wonder. If you assume there is only one form of disruption then you get into bizarre arguments such as Lepore vs Christensen arguing over predictability or not. Let us be clear both Lepore and Christensen are both right and wrong because one type of disruption is predictable whilst the other type isn't. This is a debate that can never be resolved until you realise there's more than one type. It's no different with commodification vs commoditisation or the abuse of innovation. It might make it simpler to use single words to cover multiple different things and hide the complexity of competition but if you do this then you'll repeatedly play the wrong games or try to solve the issue using the wrong techniques. 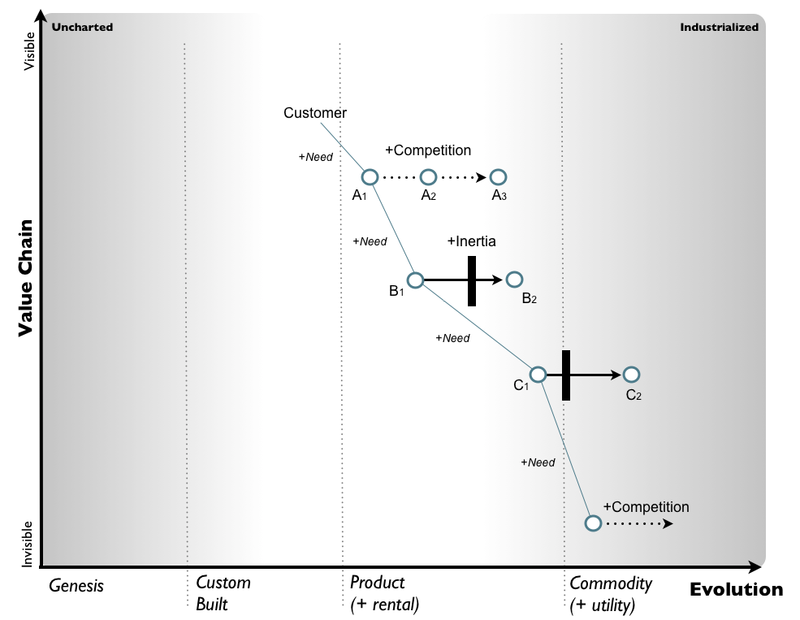 Oh, but am I really saying that we can anticipate one form of disruption, the shift from product to commodity (+utility)? YES! More than this, we can say roughly what is going to happen e.g. the disruption of past industries stuck behind inertia barriers to rapid increases in new activities built on the recently commoditised component to co-evolution of practice to new forms of data to organisational change. Actually, we can say an awful lot about this form of change. Hence we already know that as Virtual Reality systems head towards more of a commodity then we'll see an explosion of higher order systems built upon this and fundamental changes to practice (i.e. co-evolution) in related industries. Think devops for architecture but this time physical architecture i.e. from town planning to civil, mechanical and heavy engineering. But can we really say when? Yes! Well, more accurately we can do pretty good job of "when" using weak signals. 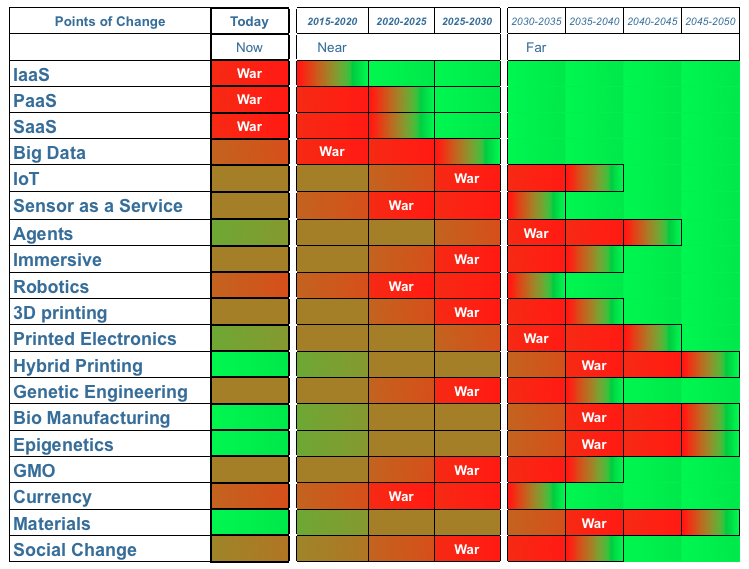 These major points of predictable disruption (which take about 10-15 years to work through) we call 'wars' and I've provided a list of them in figure 2. So we know (actually, we've known for some time) that Big Data is likely to go through a war over the next 10-15 years with industrialisation to more utility services (e.g. MSFT's machine learning, GooG's big table or AMZN's elastic map reduce) and many product vendors suffering from inertia will be taken out during the process. In fact, some of the smarter vendors seem to be gearing up for this hence Pivotal's Open Data Platform play. Others, that are not quite so savvy don't seem to have got the memo. Can we work out who will succeed in the 'war'? Fairly quickly once it has all kicked off, so with Big Data we already know who the likely winners and losers will be. Other 'wars' such as industrialisation of the IoT space to more commodity components are quite far away. Even with this, we've a good idea of what and when just not who. Still between now and when this 'war' of predictable product to commodity disruption kicks off in the IoT space, there will be lots of unpredictable product to product disruption. Now when it comes to the old 'chestnut' of 'you should disrupt yourself' then let us be clear. You should absolutely disrupt yourself by being the first mover from product to commodity (+utility). This is a change you can anticipate and position yourself to take advantage of. Timing is important because if you go too early then it's easy to undermine a viable product business when a utility business isn't suitable (i.e. the act isn't widespread and well defined enough). 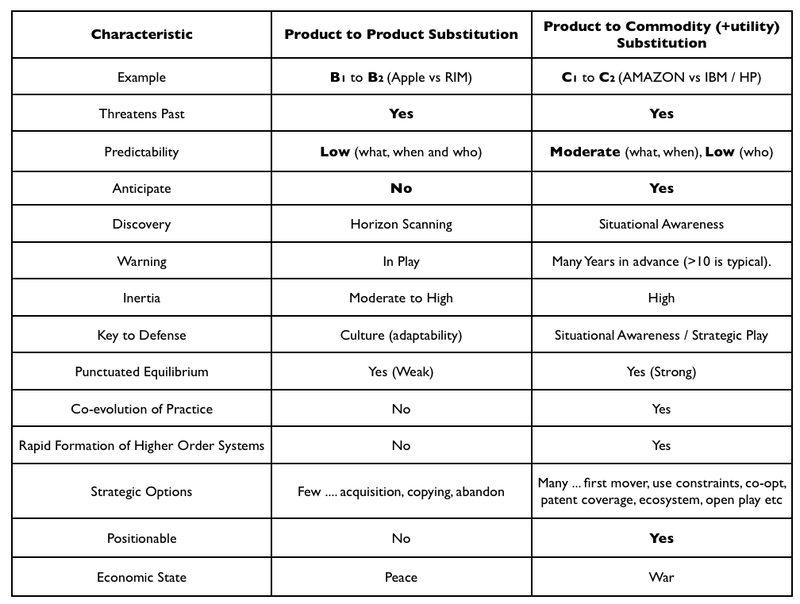 However, when it comes to product to product substitution then you have no idea - i.e. zero - of what is going to disrupt. Saying 'you should disrupt yourself' is tantamount to saying 'you should own a crystal ball'. It's gibberish. The best you can do is hope you discover the change going on (through horizon scanning), recognise it for a disruptive change (no easy thing) and adapt quickly through a flexible culture against the huge inertia that you'll have. Also, you'll need to do this all within a short period of time. Far from easy. And that's the point of this post. There are at least two forms of disruption. The way you deal with them is different. Don't confuse them. Added a link to mapping post on Canonical. Also worth noting is this post by Deloitte on Turning Disruptive Trends into Opportunity. Before anyone starts smirking about it, do remember that most of these companies have no means of understanding situational awareness. The post is fine, it covers preparation (for the predictable), scanning (the unpredictable product vs product), understanding patterns (as in basic learning from situational awareness) and confronting bias (though it does a poor job of explaining which). Remember with bias you have to hit those sixteen forms of inertia to change, misunderstandings on the pace of change (e.g. punctuated equilibriums) and various forms of bias (i.e. use aggregated map view for these). The other benefit is provide further, completely independent support to the notions of multiple forms of disruption and that some forms can be exploited. Yes, I know that some might feel that others are catching up, they always do - that's the Red Queen for you. Expect people to get better over time. But also remember that this stuff on disruption is still surprisingly advanced for most companies. The vast majority of companies you'll face still have little to no understanding of ecosystem plays, they're still struggling over organisation & cultural structure by blindly embarking on dual operating / bimodal approaches and they are generally far removed from understanding the full extent of repeatable gameplay. They lack scenario planning notwithstanding that most have no means of developing situational awareness or organisational learning. They're a long way off from the edge and by the time they they ever get close then I've a host of other useful stuff to post which will hopefully keep you going. So keep mapping, keep discovering those patterns, keep on taking out those chancers (oh, and keep on me sending me your war stories, I've been enjoying several of these).